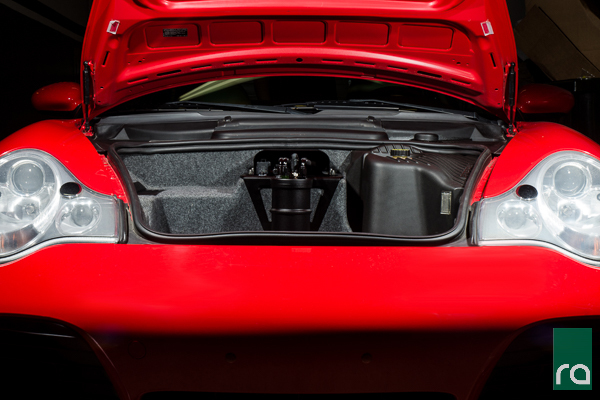 The Porsche 996 Turbo install kit locates the FST in a collision-safe area of the trunk, centered in front of the fuel tank allowing the majority of the trunk to be useable. 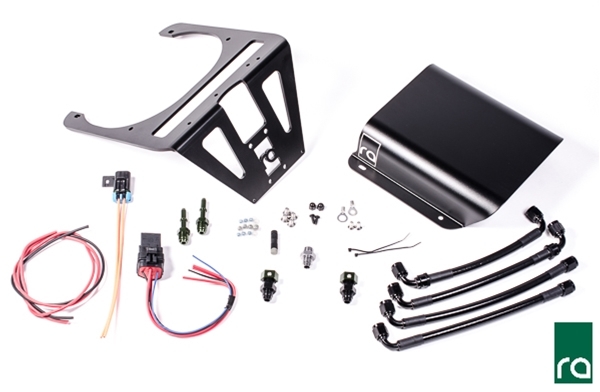 The anodized aluminum bracket solidly mounts to the OEM fuel pump cover studs and an aluminum replacement fuel pump cover is included. The OEM fuel pump hanger utilizes a sensitive dual venturi pump system that cannot be easily altered. 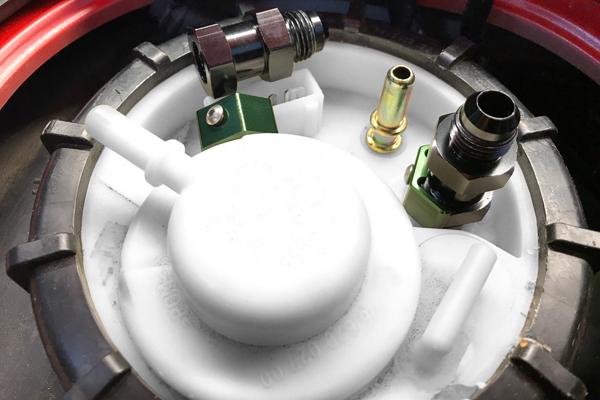 This FST install kit includes a specifically designed FST orifice that keeps the necessary pressure in the OEM venturi system. For increased flow to the FST, this Porsche 996 fuel pump upgrade HERE, is recommended. 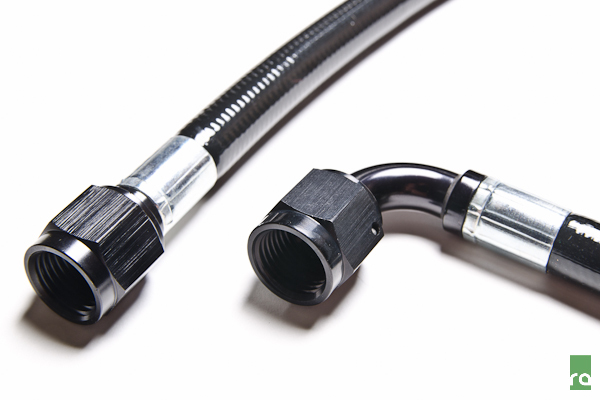 To adapt the PTFE hoses to the OEM Porsche lines, Radium has designed special low profile SAE quick disconnect fittings that are provided in the kit. Included are 4 PTFE hoses which are cut to length and preassembled. Supplied in -6AN size only. If a Radium Engineering dual internal pump FST is required, this can be achieved. However, the plumbing and electrical in this kit was designed for 1 pump. 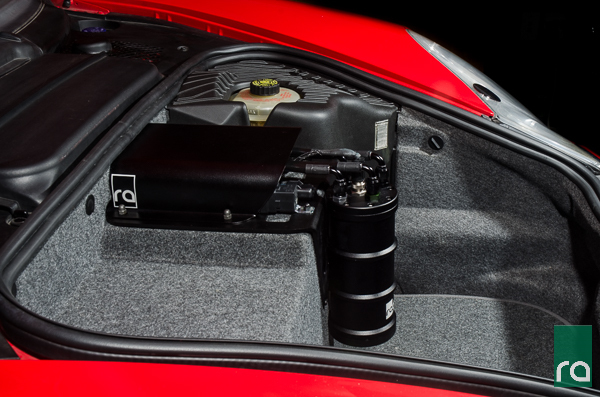 Simply choose a FST with dual pumps HERE to use with this Porsche 996 TT install kit. Also pickup a DIY harness HERE as well for the electrical required to drive the second FST pump. Lastly, you will need to plumb a second hose from the FST to the fuel rail. These PTFE hoses HERE can be helpful.